Our attorney coaches are extremely dedicated and put in many hours of work with our students. We are lucky to have coaches who come back year after year. Our students benefit greatly from working with them. Our teams put in many hours of practice to prepare for the competition. We are grateful for the time donated by the Marquette Moot Court Association and many judges and lawyers who judged the briefs and oral arguments for our NMCC regionals. 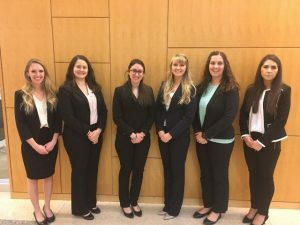 3L Associate Justice Jehona Osmani put in countless hours of preparation for the competition, and she was ably assisted by her committee, consisting of Anna Meulbroek, Ian Pomplin, Travis Bachofen, Travis Yang, Curtis Walther, Shayla Sanders, Lizzy King, Zeniat Hindi, Austin Lower, Chue Xiong, Jad Itani, and Rohit Rangarajan. We appreciate the students who participated as bailiffs: Amanda Collins, Lucas Schaetzel, Jeffrey Jensen, Bridget Smith, Kayla Gribble, John Orton, Rachel Tovar, and Scott Small. The NMCC is sponsored by the New York City Bar and the American College of Trial Lawyers. Over 150 law schools compete across the country.